The Department for Culture, Media and Sport (UK) is responsible for protecting cultural objects of outstanding quality for the whole nation, in particular through export controls, and they have just issued new Guidelines. The terms of the 1996 Treasure Act extend to original artwork and manuscripts, if we should be so lucky as to acquire them. The new Guidelines are in .pdf (Acrobat) format and can be viewed from this page on the Department's site. The Big Read is being promoted as the country’s biggest ever celebration of the magic of reading. The BBC is searching for Britain’s best-loved fiction across television, radio, online and interactive services. The public have been nominating their best-loved books and later in May the Top 100 will be announced. Over the spring and summer, readers are encouraged to read and talk about their favourites and later in the year the Top 10 will be released and voting for no.1 will commence. Celebrities have already nominated some of their favourites - ranging from Winnie the Pooh nominated by Phil Jupitus and The Pickwick Papers by Barry Norman to England their England by Ian Hislop and Lucky Jim by George Melly. To add your opinion you seem to have to post a message to The Big Read message board (and to be a registered user). When a book goes out of print just as word spreads that it’s a wonderful read, a modern fable and a delight to the eyes demand suddenly exceeds supply. It happened dramatically to Harry Potter and it happened to Hugh Montgomery’s ‘The Voyage of the Arctic Tern’. The story of the latter is even more of a fairytale. Hugh Montgomery failed to find a publisher for his book so he postponed his wedding, borrowed the money to pay for illustrations and printing, and self-published a limited edition of just 2000. After selling the entire print run through sheer hard work and local bookshops, publishers Walker/Candlewick realised that there was a market for it after all. They stepped into the breach and have since been meeting the quite considerable demand for this delightful story. The self-published edition has become even more sought after – the product of Montgomery’s belief and perfectionism - it is the true original. Devotees of the Artic Tern have had to pay over £150 to get their hands on this genuine first edition. This increase is hardly surprising in the world of first editions of children’s books – which can fetch astronomical prices. While Harry Potter hits the headlines with price tags in the thousands, less high profile authors such as Philip Pullman comfortably reach four figures. Which makes the Voyage of the Arctic Tern pretty good value. The Arctic Tern is beautifully illustrated and made in a much older mould. It follows in the footsteps of classic children’s books such as The Secret Garden which have stood the test of time. The success of the first edition makes it less surprising that, with the announcement of a further book 'Morchilla and Ptarmagon' to be published by Walker / Candlewick, Montgomery is releasing a self-published limited edition for collectors. This version will be ‘sumptuous’ promises Montgomery. Illustrated with gorgeous, richly coloured original photographs from the highest mountain ranges in the world – from the Andes to the Alps it will be ‘a book of rare beauty and (now) almost unseen quality’. The 500 copy print run will be much shorter than that for the Arctic Tern (2000) and the price will reflect the higher production costs and the relative scarcity. However, the book could make a great investment – and most importantly a beautiful object whispering adventure and mystery. Proceeds of sales promise to take the intrepid Montgomery on an adventure. To complement his career as a consultant in intensive care he climbs mountains and skydives. His next goal is an ambitious overland attempt on Everest in 2006. He is hoping that proceeds from the sale of Morchilla and Ptarmagon will help raise the $130,000 needed to fund the expedition. This year is the Everest 50th Anniversary Year and Montgomery was aiming to release the edition for the actual anniversary at the end of May but the latest date we have is now mid July. The limited deluxe edition may be ordered from ibooknet prior to publication only. The provisional price is £125.00. Please register your interest by emailing info@ibooknet.co.uk. Two previously unseen watercolours, auctioned in April by Bonhams in London for more than £40,000, are believed to be early appearances of Beatrix Potter's Peter Rabbit and Benjamin Bunny. Thought to have been intended as commercial Christmas cards, they were probably made in 1893, nearly 10 years before Potter published the first of her 24 nursery book classics 'The Tales of Peter Rabbit' as a picture-letter to her former governess's child. In 1890 she sent drawings similar to those sold recently to a London greetings card publisher and was astonished to receive her first fee of £6.00. Bonhams said the early date of the watercolours made them particularly important to scholars and collectors. The former boss of a popcorn company, who left to write romantic novels, emerged as this year's winner of the Romantic Novel of the Year in mid-April. 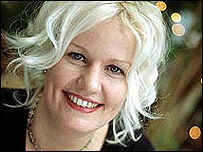 Sarah Mason, who was once voted one of the top five British entrepreneurs, won for her debut novel Playing James. In 1998 the Cheltenham-based writer was named one of the UK's top business people while running Devereux Renny, a popcorn producer with a turnover of more than £2m a year. She had been importing popcorn from the US but then decided it would cheaper to produce her own. She sold the company soon after and started a career as a writer. "Perseverance is very important. It is unlikely you will get picked up straight away," she said about her writing career. She said the worlds of big business and writing were "completely different. £10,000 prize "One is quite aggressive and you're judged on things like how you dress," she said. "But in writing if I turned up in my pyjamas and said 'here I am' it would be considered creative." The prize of £10,000 was presented at the Savoy Hotel in London. Another finalist, Sheila O'Flanagan, had previously worked as Ireland's first female chief bond dealer. She was nominated for her novel He's Got To Go. "I worked with 17 men who all looked at me in disbelief when I said I was leaving to write romance novels, but then all went out and bought the book," O'Flanagan said. The shortlist also included Kate Thompson with The Blue Hour, Vivien Kelly's Two Red Shoes, Cynthia Harrod-Eagle's Julia and Jenny Maxwell's Grey Lady. This is a humorous and poignant essay on the idiosyncrasies of book arrangements by collectors over the centuries. Professor Belanger treats the reader to some of the idiotic methods of categorizing and shelving books. One gem from an etiquette book of 1863 decreed that a perfect hostess will see to it that the works of male and female authors be properly segregated on her book shelves. Their proximity, unless they happen to be married, should not be tolerated. 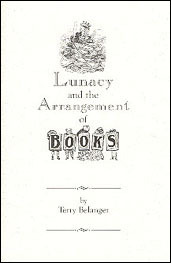 Belanger, founder of the Book Arts Press, is the University Professor and Honorary Curator of Special Collections at the University of Virginia. This book will bring a smile to the face of any bibliophile. The third impression has just become available, paperback, 6" x 9", 28 pages ISBN 1584560991. Richard Joseph, publishers of the Sheppard's Directories of Book Dealers worldwide have amended the data collection format and introduced a new Book Search facility. This facility seems to be provided for New Booksellers and is aimed at finding copies of recently out-of-print titles which may be held by Second-hand Book Dealers (note the differentiation Seller/Dealer). Full details and a form for Sellers/Dealers to complete on their site.